Does anyone else think they are seeing hedgehogs out of hibernation early this year? March 2nd seems early for my area of Scotland. However, we really haven’t had the coldest of winters so perhaps that is why they are out of hibernation now. 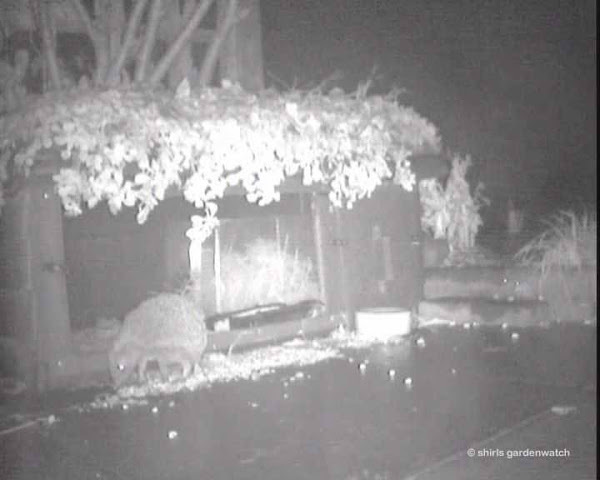 Being addicted to evening watching for hedgehog visitors live via an IR cam (and through using a torch through my window) I can confirm that for the last 5 consecutive nights we have had hedgehogs feeding on sunflower hearts on ground feeders in my garden. Last night's extra topping of crushed unsalted peanuts have been very popular too. When I opened my door, I spotted this hedgehog foraging round the empty ground feeders suggesting it knew there was food usually there! It stayed still as I quickly and quietly rushed to my shed for sunflower hearts (easiest to get in the dark). 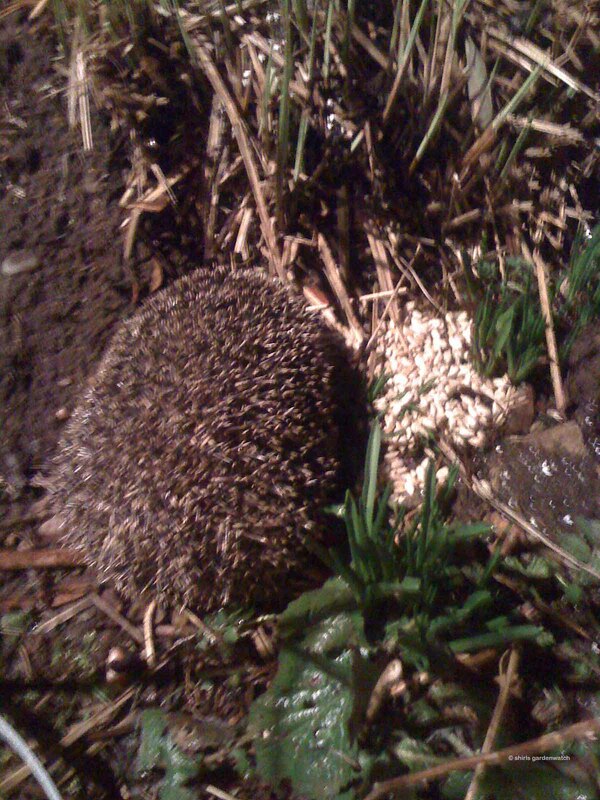 To my huge surprise I was to walk past another hedgehog en route to my shed. It too stayed still. Returning with a scoopful of sunflower hearts I quickly placed the food right in front of both hogs. The first hedgehog spotted was slower to start eating but the hedgehog in the clearer photos above and below (now known as bagman) ate almost before I had walked away. I guessed then that it was very hungry and perhaps not long out of hibernation as at any other time of year they would either run away or stay still for up to 20mins. 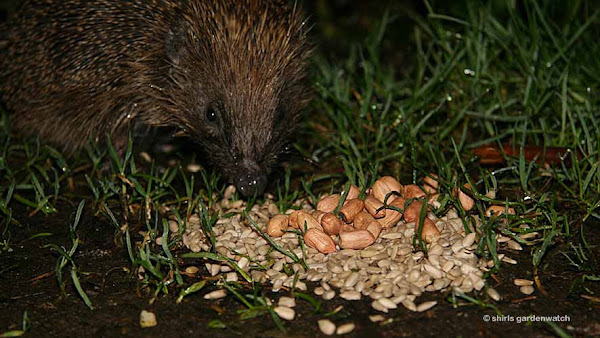 Quickly returning for peanuts (another fav for hogs visiting my garden) I placed a few in front of each hog. 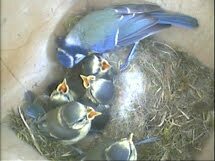 It would have been better if I had crushed them but it was the sunflower hearts that were getting eaten anyway. 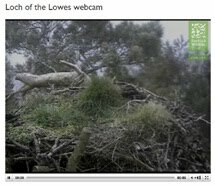 Regular blog visitors might remember my blog post on a survey by The British Hedgehog Preservation Society (BHPS) & The People's Trust for Endangered Species(PTES) featuring on the website Hedgehog Street. 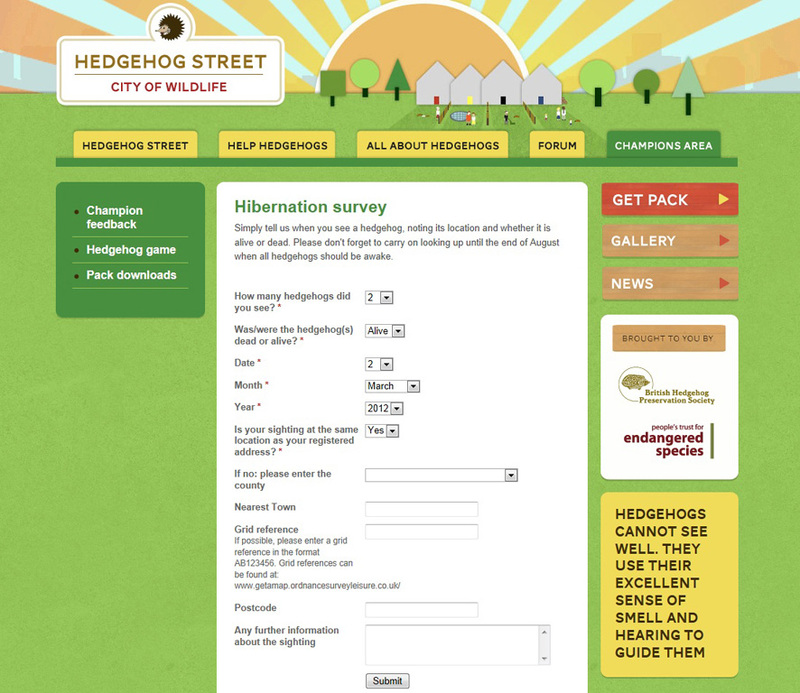 Being completely honest I didn’t expect to be adding my stats of hedgehogs being seen out of hibernation quite so soon! Below you can see my first submitted record to Hedgehog Street and I hope I can add many more. I’d like to encourage anyone that sees hedgehogs out in their gardens or anywhere outside their garden (there is a option for that as you can see below) to register and submit these sightings. 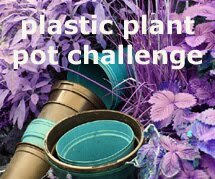 It’s simple and it will help this endangered species. 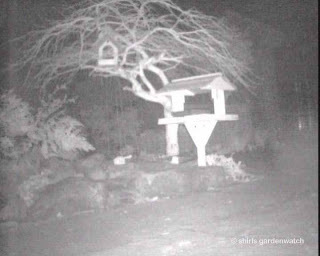 Spotting hedgehog sightings is definitely easier if you have an IR camera and if you have motion detecting software a little easier again. I don't use the latter. 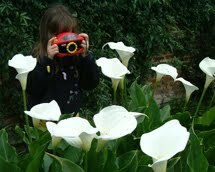 I might suggest you direct your camera to the areas below hanging bird feeders, to ground feeders and ground birdbaths. It's not just food that brings hedgehogs to gardens - they can get quite thirsty too especially during dry spells. However, as most people reading this probably won’t have a technical set-up I’d recommend standing/sitting still in the garden in the evening at dusk, around 10:30pm and around midnight. 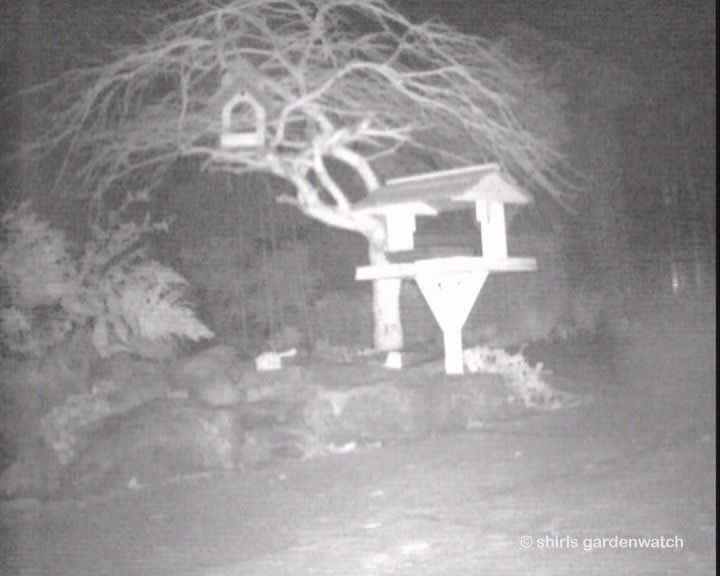 As with the IR cameras I'd watch bird feeding areas and places a hedgehog might get a drink. If you listen you may hear a rustle of them foraging through plants and as they can be noisy eaters you may hear them eat too. 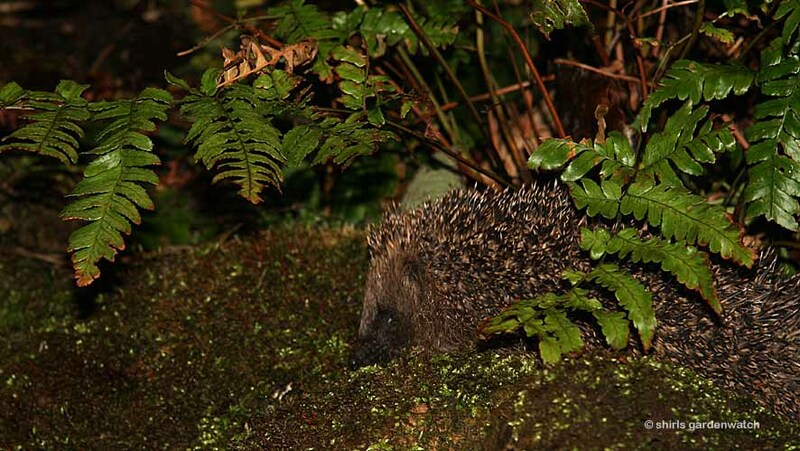 Once you have seen a hedgehog visit I’d suggest you make a note of the time as the chances are that they will be back at the same time again the next night. Note also that on rainy nights you might not see them visit at all. I’ll post a full list of my hedgehog spotting tips another time but here’s one that I find fun and successful. 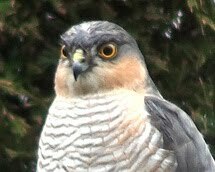 I fill the ground feeders in the evening after the blackbirds have left the garden. I take my scoop and flatten the food to the tray – nice and tidy. Nice and tidy the hedgehogs aren’t when it comes to feeding (most times they climb in the feeder). However, the biggest tell tale signs are the snout circles! Lol… great description that… but accurate too though. Take a look in the photo below and you will see what I mean. 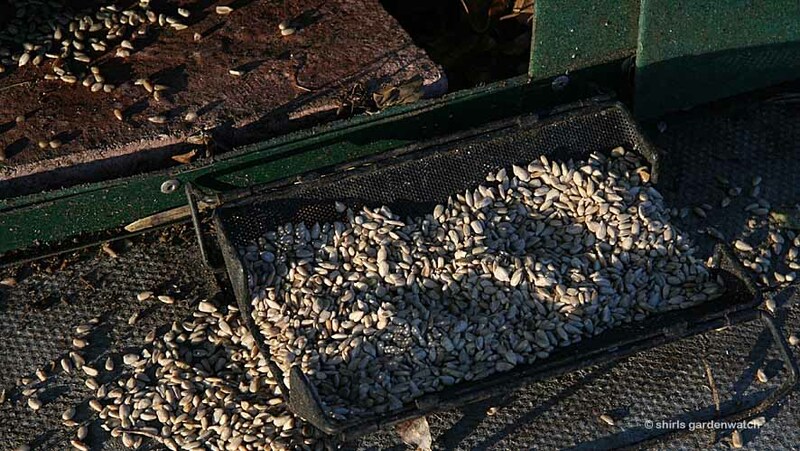 Note also the big spillage at one end too – birds don't tend to leave food in a solid mass like that. Okay, I know this is a lot of information in one post but rather than post short posts I thought this way it kept as much info together as possible to help those interested in hedgehogs. Hopefully this in turn will help the hedgehogs in their plight for survival too. So what’s the bag about in the photo opposite and ‘danger’ in my post title? Hedgehog Horror is how I headed my tweets on Monday night! Can you guess what happened and what I am about to post a warning on? My ex-guinea pig hutch refurbishment into a hedgehog feeding station (known as Hedgehog Manor with fetching green roof of saxifrage London’s Pride) has been a happy place until Monday night. You can see it in the photo below. Fortunately I was watching ‘Bagman’ (really should think of another name – suggestions please) via my outside IR cam as the one inside isn’t working due to a pruning incident with the cable last year. 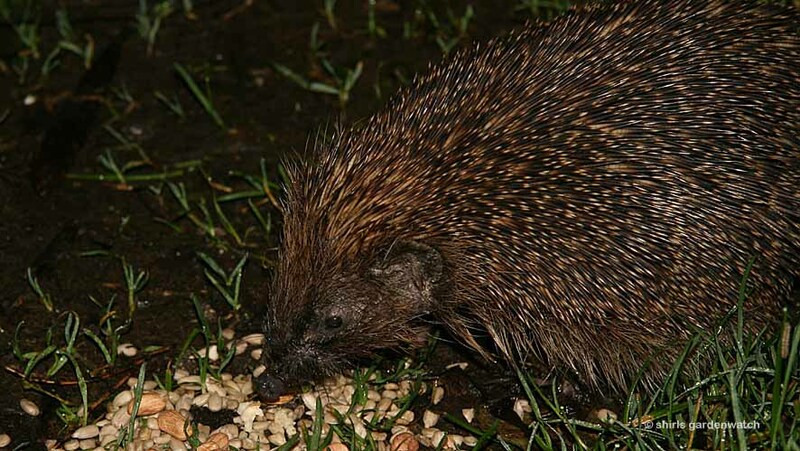 Bagman was seen foraging for insects moving around the large leaves inside Hedgehog Manor . I’m guessing… you’re guessing what happened next. With the image on my monitor being black and white I had no idea that there was a bag inside and Bagman was in trouble. 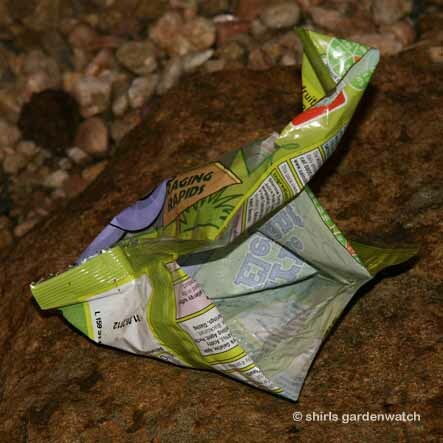 My HEDGEHOG HORROR was finding the small bag in the photo above (slightly smaller than a standard crisp bag) had Bagman’s head stuck in it! I immediately pulled away the sweet bag to find the real horror… that the pretty face of the hedgehog above that I had seen a few nights before was a grey blue colour – it had been suffocating! 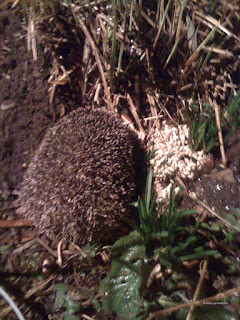 As you might expect, seeing a hedgehog in trouble like this due to my actions of putting food in this area did upset me. The bag was not our rubbish but had blown in to my garden and I didn’t know it was there and what harm rubbish like this could cause. That image of this hedgehog’s face will remain with me. After removing the bag, I left Bagman where it was hoping that he would recover. He wasn’t limp at all, still upright, he just stared straight at me as I left him. I returned to my computer monitor and kept an anxious eye on him. Eventually, Bagman began foraging again, rested, foraged again, rested, foraged… and 1 hour 20 mins after he was spotted with his head stuck in a bag he went out into the night. Would he survive the night? Now that was the question in my head. 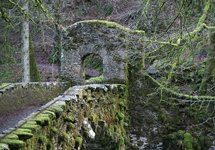 Knowing Bagman knew food could be found in this area there was a high chance he might return to visit Hedgehog Manor again. I went out to my shed to find my first hedgehog feeding station – a plastic jelly box with a 13cm x 13cm entrance at one end. Taking some fresh hay from the guinea pig stash, my smaller first feeding station and my torch over to Hedgehog Manor I fully investigated inside for any other rubbish inside. All clear… I then pushed my upturned jelly box into the corner that had been the scene of the almost suffocation earlier. It was a cold night and I went to my cosy bed knowing at least I had left a cosy, safe place for Bagman should he return during the night. I knew I would be able to tell if anyone had been napping in the hay (some would get dragged out) by looking in the morning. Oh dear… I found it undisturbed. You’ll be delighted to know that this Horror story isn’t going to be left with a cliff-hanger! Bagman was quite easily identified when he visited as he looks a bit long legged and has clumsy looking feet when he walks. Oh yes… one scratching session in front of the camera confirmed he was male too. Around 8pm had become a regular slot for Bagman over the previous 2 nights and last night just before 8pm, his long legs and clumsy looking feet were spotted at the blackbird ground feeders… yay! You can see his pretty face again in the final photo below – he looks okay after his bag trauma too! Oh yes… as expected he returned to Hedgehog Manor and not just once either! He explored the Hay Room for numerous naps too. Phew! Finally… just look at that sweet face of Bagman! 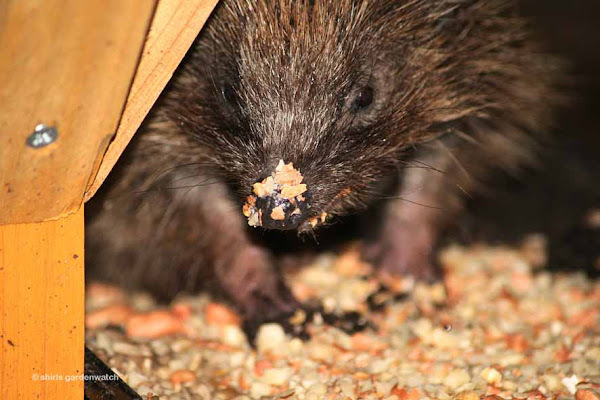 Isn’t he just adorable with his wet snout coated in the peanuts I crushed for him? Let’s give him a name to suit his visits to my garden… any names spring to mind? 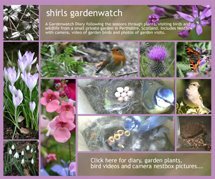 This post was written by Shirley for shirls gardenwatch in March 2012.